Hydroxycut Advanced - Diet Pill Reviews: Does Hydroxycut Advanced Really Work? Hydroxycut Advanced is a reformulated weight loss product designed to improve the benefits achieved from the Original Hydroxycut formula. Hydroxycut Advanced is said to be the latest and most powerful fat-loss supplement available without a prescription. How Does Hydroxycut Advanced Work? 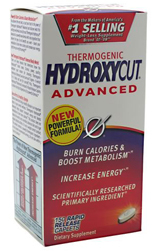 Unlike the Original Hydroxycut, Hydroxycut Advanced contains powerful ingredients without the side effects of the formerly popular chemical, ephedra. Additionally, Hydroxycut Advanced has been designed with the support of the popular fitness institution, MuscleTech’s, technology and research. MuscleTech innovators were involved in the design of the Advanced Hydroxycut formula, as creators assert that the ingredients have been carefully chosen to provide dieters with safe and powerful compounds to foster success. According to the manufacturer, some consumers have boasted that the benefits Hydroxycut Advanced exceeded their expectations. According to one consumer, taking Hydroxycut Advanced helped the dieter lose 27 pounds in just 8 weeks. Similar to the study, this dieter also engaged in a diet restriction and fitness program while taking Hydroxycut Advanced. As the manufacturer reports, many fitness models and athletes take Hydroxycut Advanced in order to experience an added edge as they engage in their routine exercise and diet programs.